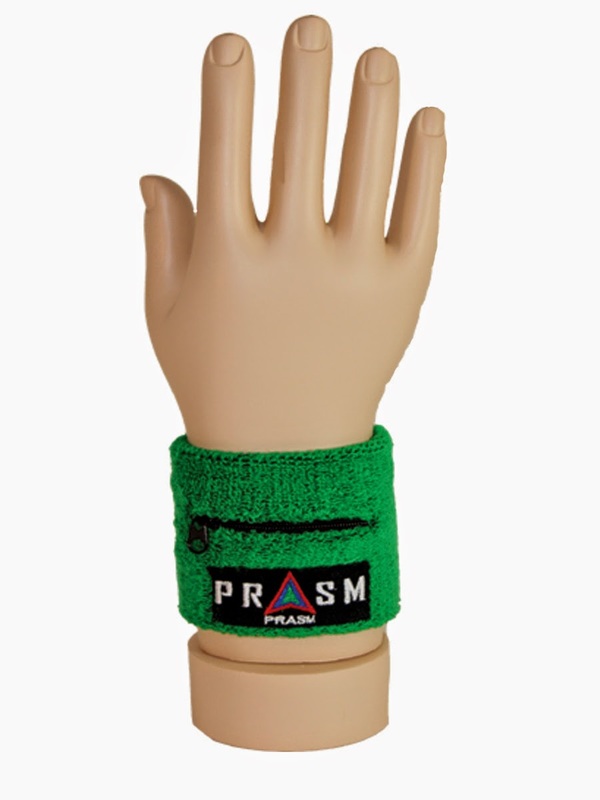 Welcome to PRASM: Keep Your Valuables Secure with a PRASM Sports Wristband! Keep Your Valuables Secure with a PRASM Sports Wristband! Do you ever desire to go for a run or walk or to the gym, but don't feel like being weighed down by your wallet or (coin) purse? 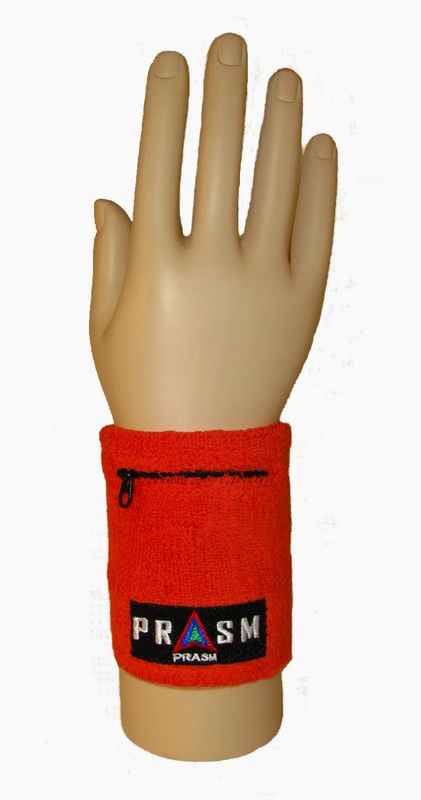 The PRASM Water-Resistant Zipper-Pocket Wristbands are the perfect clothing accessory for your sporting activities. Our PRASM Zipper-Pocket Wristbands can hold your keys, debit/credit cards, I.D.s, loose change, and bills. Our sports wristband gives one the security of knowing that they have their most immediately valuable items within reach. The PRASM Zipper-Pocket Wristband is made of a high quality, Ring-Spun Absorbent Cotton-Blend which features an elastic band for comfort, fit, and superb shape retention. Our patented Water-Resistant pocket liner is designed to protect your valuables from getting wet from sweat and the elements during your daily workouts or runs. There are two different sizes/styles you can choose from. Size A (on the left) is our short wristband, good for holding money and a key or two. Size B (on the right) is our longer wristband, good for holding money, keys, I.D.s, and debit/credit cards. We currently carry these wristbands in an assortment of vibrant colors to suit any taste! 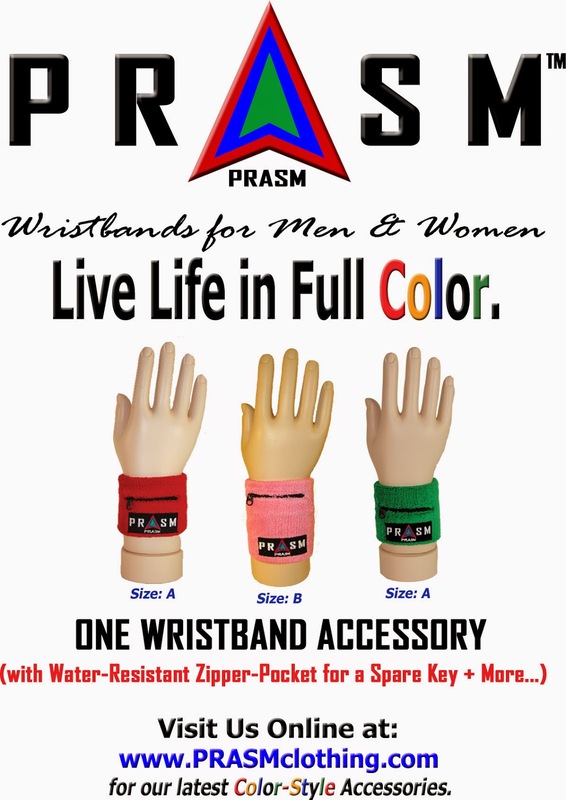 PRASM Clothing products are also designed for those who consider themselves fashion-forward, and are some of the most unique and original accessories around! So if you simply want to wear your PRASM sports wristband for style, feel free to do that as well! They add a great pop of color to your more relaxed and casual styles. Looking to grab a couple of our new Water-Resistant Zipper-Pocket wristbands? Find an assortment of colors at eBay.com or Amazon.com. To learn more about us or to browse our full collection of PRASM accessories, feel free to visit us at www.PRASMCLOTHING.com or on our blog at www.PRASMCLOTHING.blogspot.com.